We arrived at Nugget Point that was getting dark. 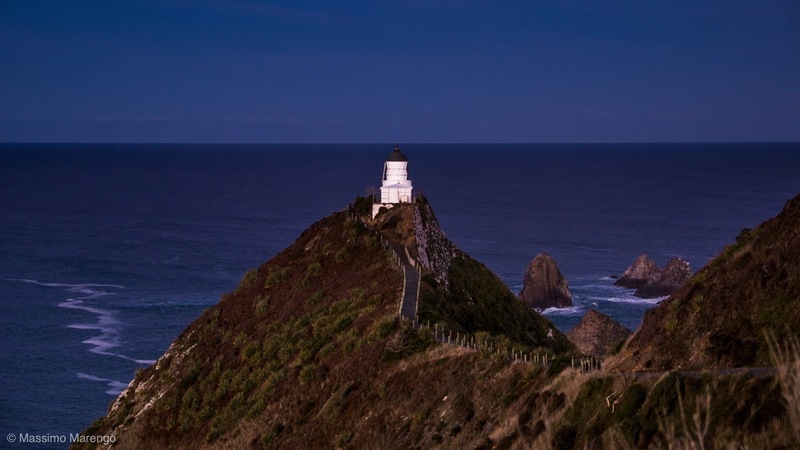 The main feature of this rocky headland is the white lighthouse (photos below), which is accessed from the main Catlins “highway” through an unpaved road closely following the coastline. The last part of this road is narrow and steep, in some points impressively so. Our rented Ford Focus seemed capable to negotiate the slope quite well, so we drove to the end (even though I was a little apprehensive at the idea of having to drive back in the dark). Just before the last curve we saw a sign about an “observatory” for the local colony of penguins. We stopped the car and walked on a narrow path leading to a wooden hut hanging to the cliffs. From the windows of the hut there was a good view of the beach and the grassy slope below. At first we didn’t see anything. Then, we saw a pair of yellow-eye penguins pruning, on a platform mid-slope. 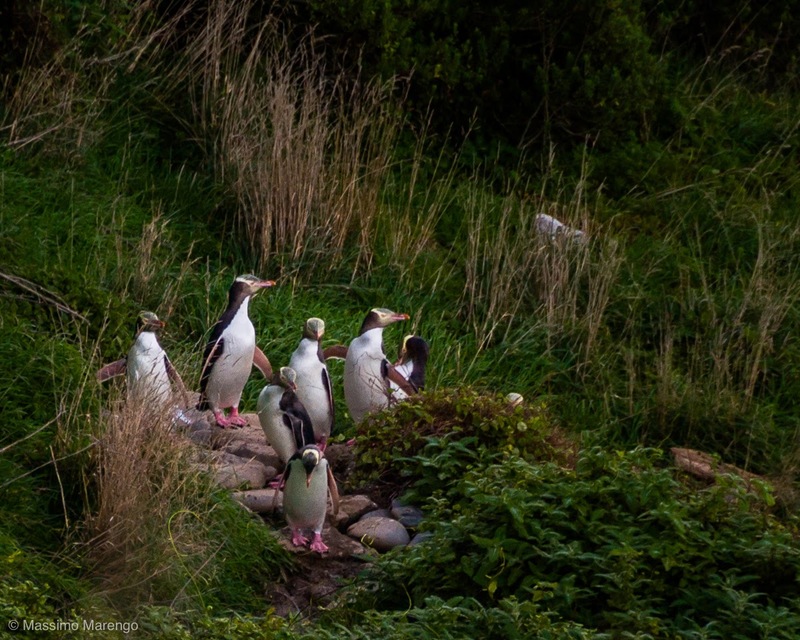 After a little while, we started seeing one, two, many penguins slowly and clumsily walking out of the water. One would expect penguins to be well adept in getting in and out of the water. Well, that’s not the case. These penguins seemed to do a huge effort to get on dry land, as for every two steps they were negotiating with the swell, the next wave would push them back one step. In the end a dozen or so congregated around the few boulders shown in the photo above. The individuals we saw were all adults, as shown by the yellow band circling around their neck (compare to the photo of the juvenile we saw at Akaroa Harbor). After spending the day at sea they were retreating on terra firma to rest for the night. As we were watching them, it got dark to the point that making photos was getting impossible. We walked to the lighthouse and then back to the car, aware that we needed to drive 230 km more to get to Oamaru, were we intended to spend our last night in the South Island.